9:00 AM to 12:00 PM | Save the Date! We see the headlines and we know it happens all the time—loved ones, co-workers, friends in the community are affected deeply by unexpected loss. 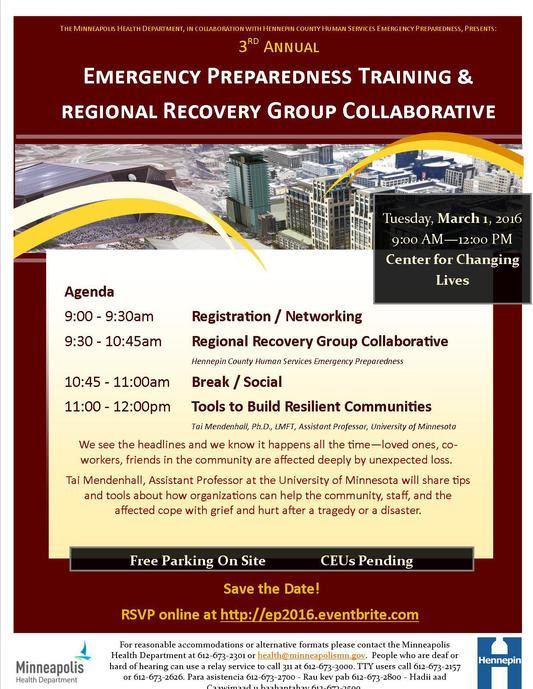 Tai Mendenhall, Assistant Professor at the University of Minnesota will share tips and tools about how organizations can help the community, staff, and the affected cope with grief and hurt after a tragedy or a disaster. Join us at the Center for Changing Lives on March 1st, 2016 from 9:00 AM to 12:00 PM. Free parking on site. CEUs pending. The Center for Changing Lives is located at 2400 Park Avenue, Minneapolis, MN 55404. For reasonable accommodations or alternative formats please contact the Minneapolis Health Department at 612-673-2301 or health@minneapolismn.gov. People who are deaf or hard of hearing can use a relay service to call 311 at 612-673-3000. TTY users call 612-673-2157 or 612-673-2626. Para asistencia 612-673-2700 – Rau kev pab 612-673-2800 – Hadii aad Caawimaad u baahantahay 612-673-3500.